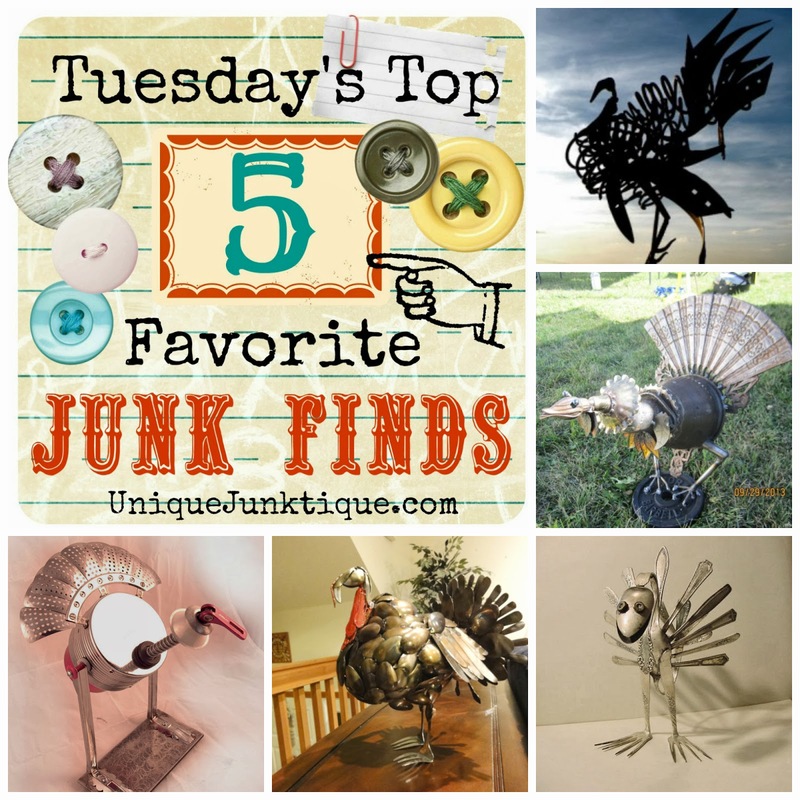 Time for Tuesday’s Top Five once again! November and the holiday season is upon us. 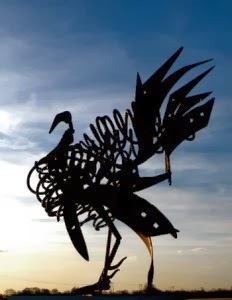 I stumbled across some wonderful metal turkey art sculptures created from re purposed materials and wanted to spotlight the artists and their wonderful metal junk works of art with you for the upcoming Thanksgiving holiday. *All photos and artworks featured in this round up are to be credited to the featured artists with their web links respectfully posted . I love the use of the re purposed light fixture and display base on this one! 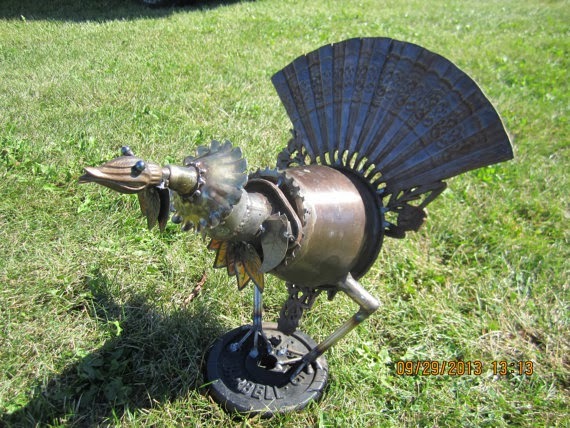 Next we have this wonderful recycled metal turkey art from John Gilchrist hailing from East Haddam, CT. 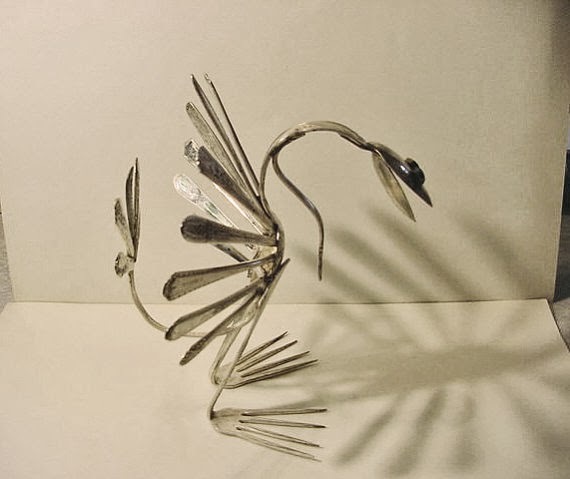 He takes common stainless steel flatware and turns it into whimsical junk art sculptures through cutting, shaping, and TIG welding. (If you want to learn more about the different types of welding, visit CromWeld.com.) He flame treated this piece to bring out the natural coloring, added a pop of red and then applied a clear coat. His works are displayed in various businesses near his hometown. You can view more of his works on Facebook and Etsy alike. Isn’t it just sublime? 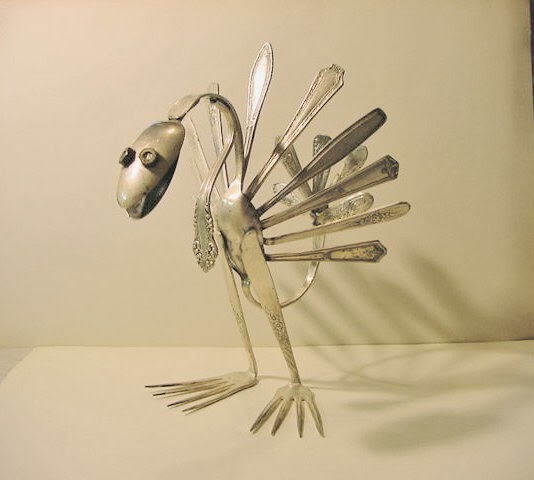 Since we are talking about silverware, how about this metal turkey art piece by K.C.R.S.C a family artist collaborative over on Etsy, created from silver plated flatware this turkey is adorable! I love the configuration of the overall design. I have an affinity for using repurposed silver plate in artworks myself, and I simply adore this guy! Next in this weeks line up, may I introduce the work of Timothy Sprenglemeyer from Midwest Recycle Art, currently residing in Madison, WI. Through plasma cutting and welding he creates these whimsical sculptures out of junk items that would normally wind up in the landfill. His works have been on display in Galleries and art shows, you can view his collection on his website, Facebook and purchase on Etsy. Currently he is affiliated with a cooperative workshop Sector 67. I love the choice of junk for the arrangement on this guy! You can enjoy more of her works on Facebook, stop by and share the love. Or view her bio at The Border Sculptors Org. 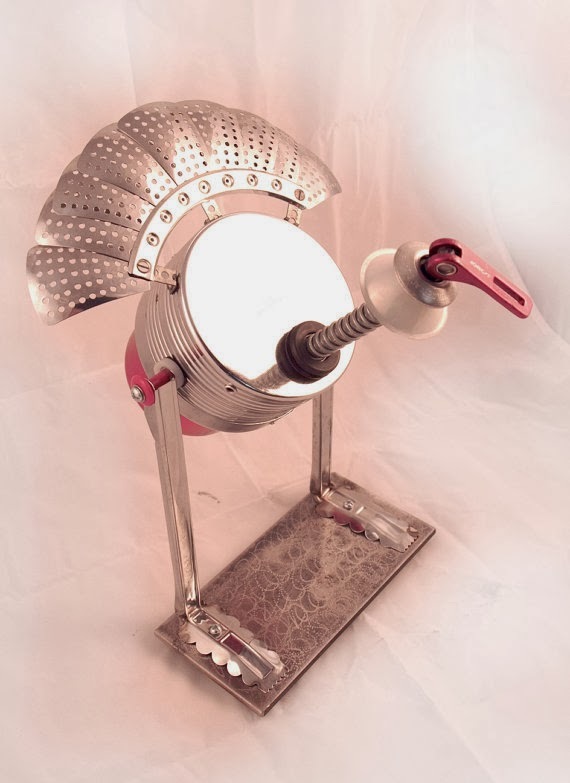 Doesn’t she create a amazingly remarkable rendition of metal turkey art with this configuration of junk? 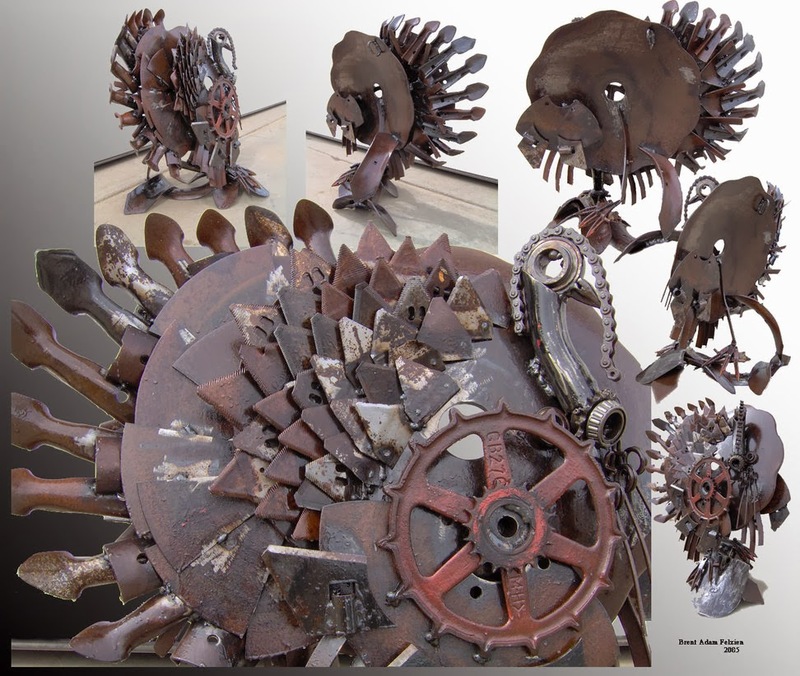 And in keeping with the farm implements, here is the bonus featured artist of the week, my favoritemetal turkey art piece of all by artist Brent Felzien from Alberta, Canada. Brent created this work from his fathers scrap metal pile on the farm. He chose to celebrate it’s original rusty patina, yet prevent further oxidation by using a clear metal varnish to finish it off. And you all know how I love rust on my junk! The structure on this work is just superb, I adore it so! 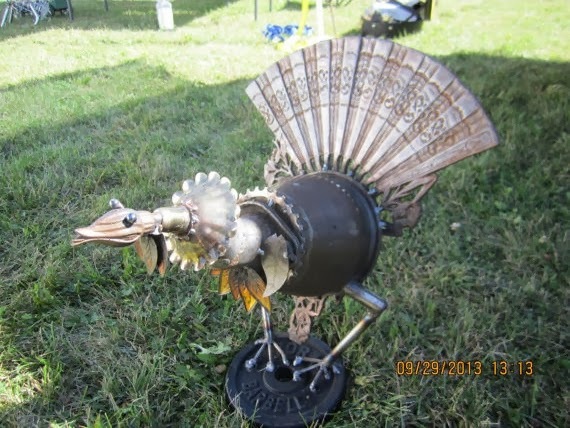 I hope you enjoyed this weeks showing of featured artists and their upcycled metal turkey art in celebration of Thanksgiving! If so, It would be fabulous for you to keep in the giving nature of the holiday, stop by their sites to give them some well deserved recognition, and share the love. Thanks so much for stopping by this weeks showing!